Facial paralysis can be a consequence of traumatic facial nerve injury, iatrogenic causes, malignancy, congenital syndromes, and viral infections. Prolonged paralysis can result in ocular complications, articulation difficulties, impaired feeding, and difficulty in conveying emotion through expressive movement. Numerous reanimation techniques are available to restore function and are based on the cause of the facial paralysis, type of injury, its location, and the anticipated duration. These methods are broadly classified into 4 types as follows: (1) neural methods, (2) musculofascial transpositions, (3) microneurovascular transfer (4) facial plastic procedures, and (5) prosthetics. The most desirable procedures to reestablish the mimetic control of the face are based on a sequence of operations. The surgeon chooses the procedure that has the highest likelihood of achieving the best functional and cosmetic result. Dynamic procedures aim to restore some voluntary movement and, thus, are more desirable. Free flap reanimation and static procedures are reserved for patients whose motor endplates are not viable, typically from congenital syndromes or after long-term denervation. Combinations of the above procedures may be appropriate depending on the circumstances. An image depicting the facial nerve can be seen below. Superior view of the intracranial, meatal, labyrinthine, and tympanic segments of the facial nerve; anterior inferior cerebellar artery (AICa), cochlea (C), chorda tympani (CT), external auditory canal (EAC), geniculate ganglion (GG), greater petrosal nerve (GPN), and labyrinthine artery (La). Attempts to correct facial paralysis date back to 200 AD, when Galen actually discussed the possibility of nerve regeneration. However, the first documented suture repair of a nerve is attributed to Paul of Argina in 600 AD. A. Waller, who recognized that peripheral nerves could regenerate, rediscovered this work in the 1850s. With experience from World War II, H.J. Seddon is credited with introducing the use of cable grafts after it was noted that the primary repair would lead to unacceptable tension and poor results. With the introduction of magnification, including the operating microscope and loupes in peripheral nerve repair, results greatly improved. Evidence of this improvement was reflected in many other papers published after this time. As early as the turn of the century, Alexer in Eden recognized the transposition of muscles in lieu of primary nerve anastomosis. Reuben, Baker, and Connelly repopularized this intervention in the late 1970s by using either the temporalis or masseter muscle. Techniques for facial reanimation have a long and protracted history, but it was not until the modern era with the advent of finer sutures, magnification, and better understanding of physiology that results from reanimation techniques dramatically improved. Total disruption of the facial nerve does not permit restoration to complete normalcy. Therefore, realistic expectations must be established at the initial encounter and candidly discussed between the physician and the patient. Choice of reanimation procedure is dictated by the duration of paralysis and the status of the mimetic musculature’s motor endplates. Neural procedures are indicated if the duration of paralysis is less than 24 months and the electromyography (EMG) shows fibrillations, indicating denervation with intact motor endplates. If the motor endplates are not viable (electrical silence on EMG) or immediate restoration of some movement is desirable, muscle transposition techniques should be considered. To perform the reanimation procedures, the surgeon must have a thorough knowledge of the anatomy of the facial nerve. The facial nerve originates within the pons and exits between the olive and inferior cerebellar peduncle. At this location, the nerve forms a 12-14 mm intracranial portion within the cerebellopontine angle, as shown below. The facial nerve then enters the temporal bone, where it is confined within a bony conduit. As it enters the internal meatus, the nerve lies in the anterior superior quadrant, traveling about 10 mm before reaching the lateral end of the meatus superior to the crista transversalis and anterior to the vertical crista (Bill's bar). Exiting the internal auditory canal, the nerve gradually curves anteriorly around the basal turn of the cochlea where it enters the infratemporal portion and travels 2-4 mm. This segment of the facial nerve courses through the narrowest portion of the fallopian canal, making it the most susceptible to damage from inflammatory conditions. The geniculate ganglion is then formed by the union of the facial nerve and the nervus intermedius into a common trunk. The greater superficial petrosal nerve, the lesser petrosal nerve, and the external petrosal nerve all branch off of the geniculate ganglion while the facial nerve exits and takes a 40-80° turn, marking the first genu of the facial nerve. The nerve then courses posteriorly and slightly inferiorly, traveling 11 mm across the tympanic cavity. This horizontal course lies superior to the oval window then makes its second genu as it leaves the oval window niche, passing anteriorly and caudal to the lateral semicircular canal. It then passes lateral to the sinus tympani and the stapedius muscle to form the vertical (mastoid) portion within the temporal bone. At the end of this 13-mm segment, the facial nerve exits from the stylomastoid foramen, where it becomes the extracranial segment. The nerve first innervates the posterior belly of the digastric muscle and then travels 15-20 mm to enter the parotid gland. In the parotid gland, it divides at the pes anserinus into 2 main branches, namely, the temporofacial and cervicofacial. Terminal ramifications of these branches to the temporal, zygomatic, buccal, mandibular, and cervical regions are variable. 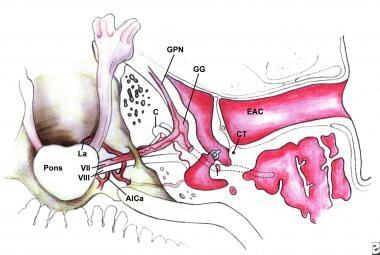 Terminal branches of the facial nerve are depicted below. 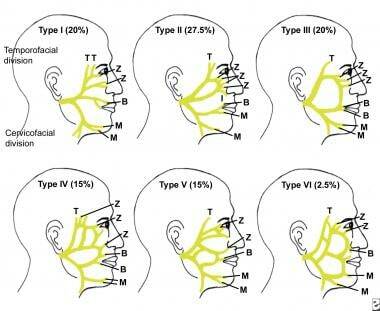 Terminal branches of the facial nerve are depicted below. Terminal branches of the facial nerve, demonstrating its variability; buccal (B), mandibular (M), temporal (T), and zygomatic (Z). The nerve fibers travel in groups called fascicles, which vary according to the level. The fibers are surrounded by 3 types of connective tissue: endoneurium, perineurium, and epineurium. The structure of the fascicles varies considerably throughout the course of the nerve. For this reason, direct repair of the fascicles is not feasible and may be counterproductive. No contraindications exist for facial reanimation, unless a patient is not able to tolerate general anesthesia; however, specific guidelines must be followed. If the possibility of spontaneous facial nerve recovery exists, then any procedure that involves transsection of the nerve must be avoided until lack of recovery is certain. Any attempt to restore facial function by reestablishing nerve continuity requires intact motor endplates. Nerve continuity can be re-established by direct facial nerve anastomosis, interpositional grafts, or anastomosis to other cranial nerves. Selection of these procedures cannot be considered up to 3 years following the original insult. The possibility still exists for motor endplates to survive from 1-3 years after the original insult. An EMG can be obtained to determine viability of the motor endplates. Cross-over technique cannot be used if the donor nerve is essential to the overall function of the patient. May et al. Thieme. Facial Paralysis. Rehabilitation Techniques. 2003. 24-25. Gur E, Zuker RM, Zaretski A,et al. Incomplete facial paralysis - the use of the ipsilateral residual facial nerve as a donor nerve for facial reanimation. Plast Reconstr Surg. 2018 Mar 29. [Medline]. Labbè D, Bussu F, Iodice A. A comprehensive approach to long-standing facial paralysis based on lengthening temporalis myoplasty. Acta Otorhinolaryngol Ital. 2012 Apr. 32(3):145-53. [Medline]. [Full Text]. Nduka C, Hallam MJ, Labbe D. Refinements in smile reanimation: 10-year experience with the lengthening Temporalis Myoplasty. J Plast Reconstr Aesthet Surg. 2012 Jul. 65(7):851-6. [Medline]. Gousheh J, Arasteh E. Treatment of facial paralysis: dynamic reanimation of spontaneous facial expression-apropos of 655 patients. Plast Reconstr Surg. 2011 Dec. 128(6):693e-703e. [Medline]. Hontanilla B, Qiu SS. Transposition of the hemimasseteric muscle for dynamic rehabilitation of facial paralysis. J Craniofac Surg. 2012 Jan. 23(1):203-5. [Medline]. Oyer SL, Nellis J, Ishii LE, Boahene KD, Byrne PJ. Comparison of Objective Outcomes in Dynamic Lower Facial Reanimation With Temporalis Tendon and Gracilis Free Muscle Transfer. JAMA Otolaryngol Head Neck Surg. 2018 Oct 11. [Medline]. Guelinckx PJ. Blink Restoration in Long-standing Facial Paralysis: Use of Free Neurovascular Platysma Transfer. Plast Reconstr Surg Glob Open. 2018 Oct. 6 (10):e1939. [Medline]. [Full Text]. Manktelow RT, Tomat LR, Zuker RM, Chang M. Smile reconstruction in adults with free muscle transfer innervated by the masseter motor nerve: effectiveness and cerebral adaptation. Plast Reconstr Surg. 2006 Sep 15. 118(4):885-99. [Medline]. Snyder-Warwick AK, Fattah AY, Zive L, Halliday W, Borschel GH, Zuker RM. The degree of facial movement following microvascular muscle transfer in pediatric facial reanimation depends on donor motor nerve axonal density. Plast Reconstr Surg. 2015 Feb. 135 (2):370e-81e. [Medline]. Liu AT, Lin Q, Jiang H, Sun MQ, Zhang JL, Zhang YF, et al. Facial reanimation by one-stage microneurovascular free abductor hallucis muscle transplantation: personal experience and long-term outcomes. Plast Reconstr Surg. 2012 Aug. 130(2):325-35. [Medline]. Hembd A, Harrison B, Rocha CSM, et al. Facial Reanimation in the Seventh and Eighth Decades of Life. Plast Reconstr Surg. 2018 May. 141 (5):1239-51. [Medline]. Iseli TA, Harris G, Dean NR, Iseli CE, Rosenthal EL. Outcomes of static and dynamic facial nerve repair in head and neck cancer. Laryngoscope. 2010 Mar. 120(3):478-83. [Medline]. Greater auricular nerve located superficial to the sternocleidomastoid, perpendicular to a line drawn between the mastoid and the angle of the mandible. Sural nerve located just lateral to the saphenous vein and medial and posterior to the lateral malleolus of the ankle. Nerve crossover using the proximal trunk of the hypoglossal nerve to the distal trunk of the facial nerve. The temporalis muscle transfer; nasolabial incision (A), scalp incision incorporated with facelift incision behind the ear (B), superimposed incisions over the temporalis muscle indicating a harvest of the middle portion of the temporalis muscle (C), incision of the temporalis muscle superiorly, separating the periosteum from the skull base (D), transfer of the temporalis muscle in a subcutaneous plane, but superficial to the muscular aponeurotic system (E), and insertion of the temporalis muscle into the orbicularis oris muscle with an overcorrected position (F). Intraoral approach harvests the masseter muscle for transfer. Incision is made along the gingival sulcus (A). One muscle is exposed; curved scissors are used to transect the muscle in the midportion (B). Two slips of muscle are attached to the dermal layers of the skin for overcorrection of the smile (C). Gold implant technique for upper eyelid closure. Incision is made several centimeters above the upper eyelid (A). With a sharp instrument, the tarsal plate is identified (B). The gold implant is sutured in place, straddling the tarsal plate and slightly posterior to it (C). Lateral view is showing the position of the gold implant in the upper eyelid (D). Lateral tarsal strip procedure for ectropion of the lower lid. A lateral canthotomy incision is shown (A). Division of the lateral aspect of the lower lid into an anterior musculocutaneous layer and posterior tarsal conjunctival layer is shown (B). Tarsal strip is grasped with skin hook (C). Tarsal strip is positioned inside the lateral rim of the orbit, which has been exposed (D). Tarsal strip is sutured to periosteum inside of lateral orbital rim (E). Excess skin is excised and wound closed (F). (A) Right facial paralysis after injury to facial nerve within the mastoid. (B) Two years after direct anastomosis, patient in repose with good symmetry. (C) Excellent eye closure and mobility of the mouth with slight asymmetry. (A) Patient has facial paralysis after temporal bone resection. Interpositional graft is used. The patient has incomplete eye closure. (B) Gold implant is placed over tarsal plate. (C) One week postoperatively, patient demonstrates effective eye closure. (A) Patient is demonstrating total left facial paralysis after excision of glomus tumor. (B) One year after intraoral masseter muscle transfer, the patient is in repose with good symmetry. (C) Patient is demonstrating a symmetric smile but with incomplete eye closure. (D) Patient 2 years after lateral tarsal strip procedure of lower eyelid. (A) Patient sustained a chain saw injury to the face with severance of the buccal branch. (B) Two years after repair of the laceration without facial nerve repair, patient demonstrates excellent recovery of function. (A) Patient has right facial paralysis after resection of acoustic neuroma and loss of facial nerve. (B) One year after hypoglossal-to-facial crossover, patient demonstrates a symmetric smile. (C) Patient exhibits excellent eye closure without mass movement. (A) Patient has left facial paralysis after resection of glomus jugulare that involved the facial nerve. (B) Patient had temporalis muscle fascia transfer. Note the overcorrection and Steri-strips applied to maintain position. (C) One year after surgery, patient is in repose with excellent symmetry. (D) Patient is attempting to smile with minimal movement and slight asymmetry.